The staff at the Adoption & Family Support Center are family to my daughter and I. They have been there from the start and are still there for us. 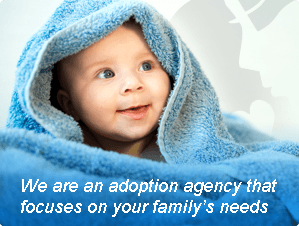 They do practice their name, Adoption and Family SUPPORT Center. I have grown from this new road in my life. I hope both, birth and adoptive families reading this will help them get through their adoption journey a little easier. This is my experiences as a first time birth grandmother. You never know what life is going to throw at you and how it is going to turn out. Here is a little background history on me. When I was between 29-37 years old, I was on my second marriage. I had a step daughter, two daughters, a son and three step grandsons by my step daughter. I am on my 3rd marriage…3rd time is the charm. I have two step daughters by my present husband and a step grandson. Even though I love my step grandsons like my own, it’s not the same. I have been saying for years, “if I ever have grandchildren, I will be to old to enjoy them or not alive at all”. You know that saying, “be careful what you wish for”….this situation with becoming a grandmother by my youngest daughter by open adoption is the second hardest thing I have done so far in my life. The first one was when my father passed away in January of 2013 and I wrote his eulogy. 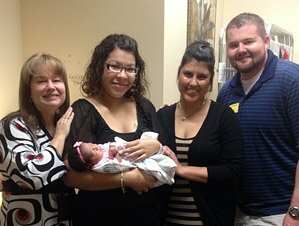 I never heard of an open adoption until the first meeting my daughter and I had with the Adoption & Family Support Center. I stood by my daughter through it all, because I was brought up that way. We met the adoptive parents, their 2 1/2 old daughter and adoptive father’s mother (two separate meetings) before the baby was born. I was ready for these to be emotional meetings, but it was just the opposite. It was like we had known each other all our lives and any doubts went out the window. We hit it off from the start, they were all great. The adoptive grandmother and I connected as grandmothers. She says we are sisters now and that our families are intertwined through family names and birthdays, which they do, so weird. So now our families have grown together through my grandson. The adoptive mom has told me that my grandson will always know that I am his grandmother. My family has grown larger with a new sister, son, daughter, granddaughter and most of all, my grandson. God had a big hand in this adoption. A bad situation has turned into a blessing. I have no worries, just joy about my grandson with his new family. This adoption was for the best, since my daughter was no ready for children. With an open adoption, we have contact and we will see him growing up. The adoptive parents have used the first name that my daughter gave her son on the original birth certificate as his middle name, which made us so happy. It has been a hard road for me, never thought this was how it was going to turn out for my first grandchild. But the end result could not have been any better with our open adoptive family and the connection we have with them. The best part of this all is that this relationship will grow through the years. Out of respect for my daughter and our adoptive family, I do not share the joy of being a first time grandmother to everyone. But who said that life is fair. The saying goes “when life throws you lemons, you make lemonade”. We have made some very sweet lemonade with God’s hand stirring it up. I told the adoptive family if they saw me crying the day they took my grandson home, it would be tears of joy. I look at life in general and human life in a different way now. The adoptive family is full of joy at this time, but they also feel and see the pain we are going through. Seeing this makes us all that much more connected as one family.